Ambiguous Garments: Are we limiting our wardrobe choices by categorising clothes? The fashion industry is littered with hybrid clothing: jeggings, jumper-dress, vest-top. Arguably, compound terms such as ‘jeggings’ are essential in marketing new designs. People find unfamiliar things unsettling, and so existing terminology is used to help consumers understand new garments. However, such terminology also has the potential to restrict creativity in fashion design. If we can only conceive of clothes in pre-exiting terms, how can we ever create something entirely new? The linguist, Benjamin Lee Whorf, proposed a theory of linguistic determinism (the ‘Sapir-Whorf hypothesis’), suggesting that “language… rigidifies channels of development”. Our understanding of the world is governed by the language that we use. When language is limited, the objects it describes appear similarly limited, and so lack of terminology often holds back progress. The problem is evident in the labelling of garments that are not quite one thing or another. Is this a dress or a jumper? It is both – a ‘jumper dress’. We define this new creation – the ‘jumper dress’ – in terms of what has come before, therefore only allowing our imagination to consider it in pre-existing terms. It is not just compound words that are problematic. Any pre-existing term equates new objects to old. Some of the most interesting garments in my wardrobe cannot be easily defined. 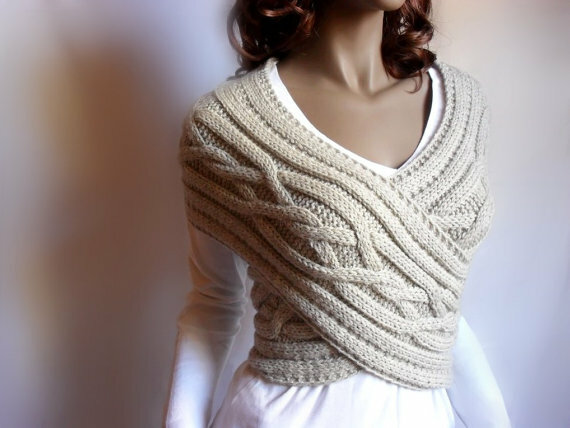 I have a kind of knitted wrap top bought from Etsy, which is essentially a scarf for the torso. The garment’s creator uses a string of familiar terms to describe her designs, as she knows that otherwise she would struggle to communicate with potential consumers. Is it a sweater, a wrap, or a scarf? This garment by Pille Ploomipuu (via Etsy) defies definition in existing terms. Ploomipuu is able to be innovative in her designs because they do not conform to standard terminology. A problem that plagued designers in the late twentieth century was the idea that “true invention is a myth”; everything has already been done before. In 1990, Malcolm Garrett declared that “all art is theft – without reference to the past nothing can be created”. It is true that fashion is cyclical, and often borrows from the past, but does this mean that innovation is no longer possible? Perhaps it only seems so because we are using old terminology. If we keep using existing terms, we will fail to identify something entirely new. We will fail to recognise innovation. It is only by introducing new language, to describe new artefacts or practices, that the unique properties of those artefacts and practices can be appreciated and that further development can be encouraged. “I decided to start from zero, from nothing, to things that have not been done before” (Rei Kawakubo interviewed in The New York Times, 1982). Her first internationally received collections “questioned the logic of clothing itself”. This has allowed her to redefine clothing, and to present shapes that do not resemble anything seen contemporaneously or historically. One of Kawakubo’s stated aims is to “design clothes that have never existed”. Many of her garments, therefore, resist established garment classifications. Kawakubo recognised that it is prescriptive to start with a brief that defines the outcome. For the fashion designer, linguistic determinism limits the possible extent of creativity. If employed to design a ‘dress’, a designer can only exercise his/her creativity within the confines of the established definition of ‘dress’ (“a one-piece bodice and skirt” ). These features are, by definition, integral to the ‘dress’ garment, and are taken for granted. Predictable design stems from assumptions. If we have too many assumptions, we will never create anything new. 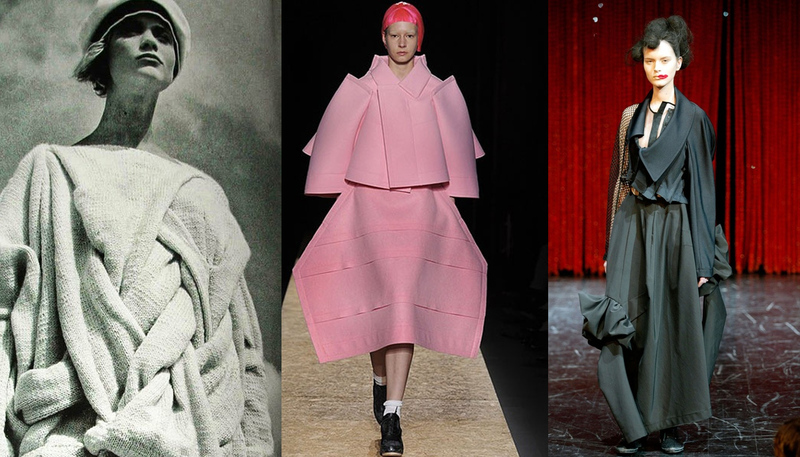 Fashion design can only be truly innovative when designers follow the example of Rei Kawakubo and “start from zero”. Whorf, Benjamin Lee, ‘The Relation of Habitual Thought and Behavior to Language,’ in ed. John Carroll, Language, Thought and Reality, (Cambridge, MA: MIT Press, 1956), 82. Garrett, Malcolm, ‘A Dearth of Typography’, Baseline (May 1990) 41. Evans, Caroline, and Thornton, Minna (1991) ‘Fashion, Representation, Femininity,’ Feminist Review, No. 38 (1991), 61. MOCAD (Museum of Contemporary Art Detroit), ReFusing Fashion: Rei Kawakubo, (2008).